Allison and I were walking around the school grounds a few weeks back and stumbled upon some pear trees. They were pretty overgrown and appeared to be untouched, so we figured we'd fill up a bag and take them home. Woo Hoo! Free pears! They were rock hard, but after doing a little internet search realized they needed to ripen off of the vine. We let them sit for 2 weeks until they started to feel a bit soft, washed them up, took a bite, and yuck. They were super sour. Allison called them the crab apples of the pear tree. They looked delicious, but looks were deceiving here. Now I know why nobody else was rushing to grab free pears off the trees. 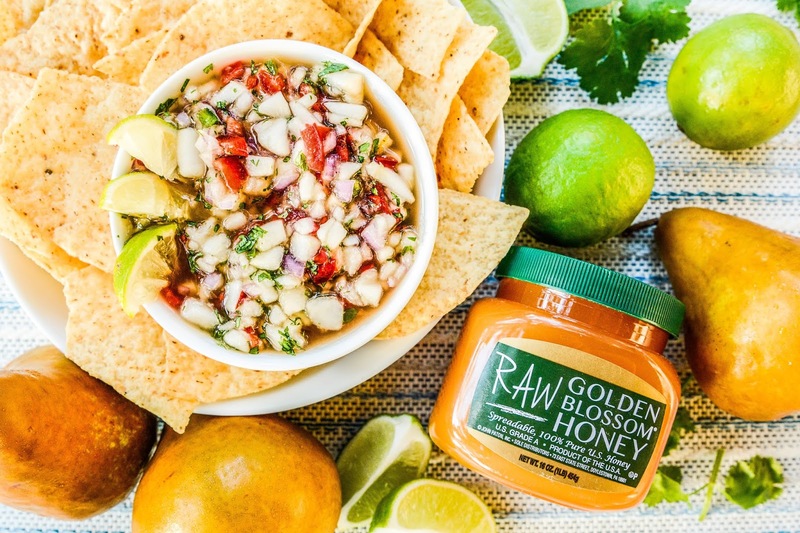 Thankfully, the stores are starting to get fresh batches of pears in the produce section because I've been itching to try this Fresh Pear Salsa recipe from Golden Blossom Honey. Now that we're full swing into football season, salsa is a high priority around these parts. You can't have a tailgating party without it, right? What intrigued me about this recipe is the spicy, yet sweet combination of flavors. 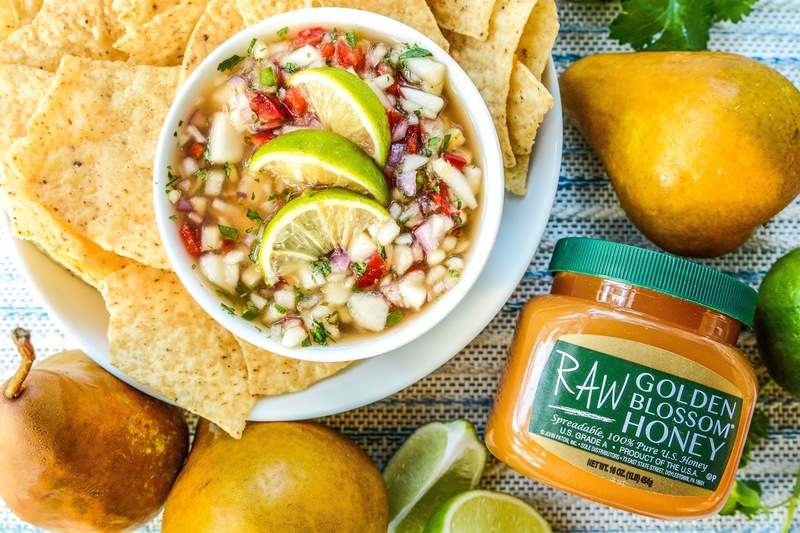 The sweetness of the pears and honey even out the heat of the peppers and onions perfectly, and the lime juice gives it that extra zing of flavor making this one well rounded salsa. It's a great recipe for last minute gatherings since it can be made from start to finish in under 10 minutes, but if you have a little extra time, let it sit in the fridge for a few hours to really let the flavors marry together. Not only is it good for chips, you can serve it over beef or fish for a little extra flair on the dinner table. What's your favorite fall fruit? I think my fave are grapes, especially white grapes as they're usually sweeter than the black ones, although the black ones are healthier. I prefer the red grapes, but the girls always insist on the green ones. I think they are too sour for my tastes. Oooh, a mango tree would be so fun! I love the fruit trees you get in Florida. I fancy I'd have a lemon or orange tree if I lived there. I'd love a lemon tree. I have a friend with a lime tree. I make good use of her fruit gifts. A lady I work with brings me avocado from her tree. Those come in handy when my grandbaby is here (she LOVES them). I don't like avocado or mango, lol. I do like oranges! Sounds like a great blend indeed. So I guess there was a reason no one picked them haha nasty as can be is a good one. Nasty they were. And, they attracted the stupid fruit flies to boot. Honeycrisp Apples are the best in the fall! Soooo crisp, sweet with just a hint of tart. Hands down the best apples (although they are pricey). Ready for some apple cider, but this weather needs to cool down a little first - it's 90 today. Ugh! Double yes on those Honeycrisp apples! And triple yes on the cider. I am so jealous of your warm weather. We had a high of 60 today :( It's supposed to rain for the next week, so I don't see those temps getting any higher here. That sounds amazing! I've always been a big fan of the heat and sweet combo. There's something about those two working together that you just can't beat. I can't wait to make this! It's such a fun combo! Really makes the senses in the mouth spring to life! Honey is hands down my favorite sweetener to use in pretty much everything. It might be the perfect food. I never thought to add pear to salsa. That sounds good. I have to say that I'm kind of annoyed with the fruit selection this time of year. I guess I'd go with apples. I made Travis get fruit on the fruit truck last week. We have peaches! Not a fruit for this time of year, but they are oh so good! I agree, the fruit this time of year is a bit dismal. I've been putting frozen blueberries in my morning oatmeal when I can't find anything else on sale in the stores. I much prefer fresh fruits, but I imagine I'll have to make do until spring rolls back around. Pear to salsa is such a creative combination. Would love to try it!! I do loved eating pear so much but never tried to use this as a salsa ingredients.. I will definitely try this to see what it taste. Apples are my favorite fall fruit. I do like pears, I've never heard of a pear salsa but it sounds like it's got an intriguing flavor. Now that's not something I would have thought to make.